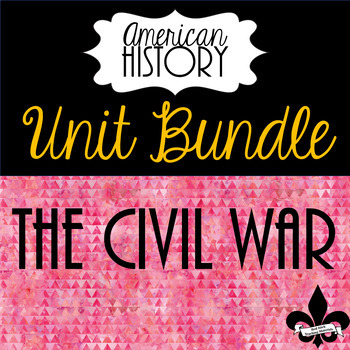 This bundle provides 9 best selling resources for The Civil War at a discounted price! Each resource was designed to engage learners and enrich the learning experience beyond what the textbook has to offer! Provide your students with colorful anchor charts, choice boards, guided mapping, and different games to help them learn about and review key concepts surrounding the study of The Sectional Crisis and The Civil War. Although these resources were primarily designed for use with middle school students, they could serve for enrichment for elementary school students and as a foundational review for any high school class! The Puzzles, I have...Who has..., and the memory/matching game are GREAT for spiraling review or for interactive test prep without the burnout! If you like this product or are looking for more hands-on social studies resources, please follow my TPT store. This way you will receive updates when new products become available.